The actor Bando Hikosaburo IV (Bando Kamezo I, 1800-1873) is in the role of the ghost Chohan outside the Nanakusa no Kwan restaurant at Yushima. The background landscape was designed by a student of Kuniyoshi, Utagawa Yoshitori-jo (active ca. 1848-1864). 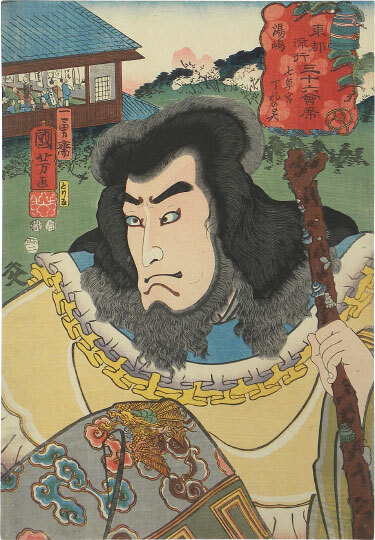 The success of Utagawa Kunisada's clever actor tokaido and restaurant series which circumvented the old restrictions on portraying actors seems to have inspired Kuniyoshi to produce his own restaurant series featuring actors. A variant impression of the print in the collection of the Museum of Fine Arts, Boston utilizes dark brown shading on the lines around the eyes, cheeks, mouth and chin, which emphasizes the age of the character. 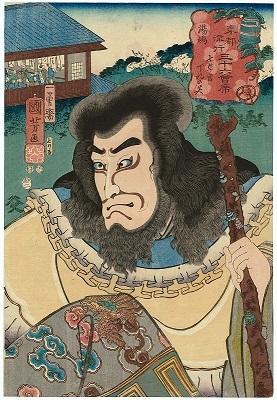 While the affect may have been appropriate for the role, it was less-than flattering for the actor, and as such, it is likely that the publisher opted to dispense with the shading block to present a more youthful likeness of Hikosaburo and make the print more appealing to his fans.